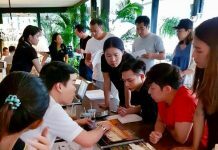 Major real-estate player PACE Development Corp. has announced that it is to construct a new, 53-storey super-luxury development next to Lumpini Park that aims to capture increased demand for freehold residences in central Bangkok, stimulated by the creation of the ASEAN Economic Community (AEC). Called ‘Nimit Langsuan’, the development will comprise of 187 super-luxury residences together with a roof top private club, as well as a first ever ‘greenhouse’-style lush garden that will provide a unique entrance experience to the building. PACE says the tower will be clad in a state-of-the-art, never-seen-before glass façade wrapping the building in a glistening reflective skin. 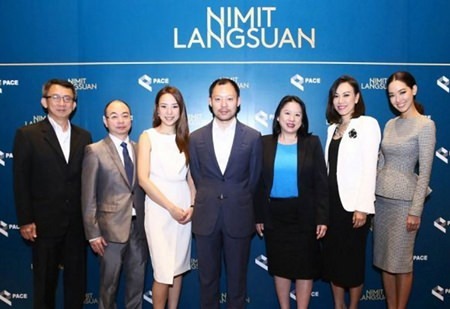 Sorapoj Techakraisri (centre), CEO of PACE Development Corp., stands with fellow company directors and management during the announcement of the Nimit Langsuan project in Bangkok, Feb. 26, 2015. With a total project value of approximately THB 7,500 million, it is being built on approximately 3 rai of freehold land on Langsuan Road. Construction is expected to start in October 2015 and will be completed within the second half of 2018. 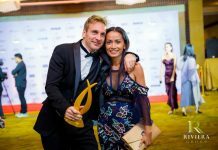 He credited the fast sales to PACE’s reputation as a leader in high-end development with the majority of sales for Nimit Langsuan taken up by existing clients. In addition, he mentioned the ‘AEC-Effect’, citing surging interest for the highest quality residences as a result of the increased mobility within the region for wealthy individuals. The residences at Nimit Langsuan will range in size from 78sqm to 617sqm, most with 2-4 bedrooms, and with ceiling heights of three metres and higher. The prices start from around THB 25 million up to THB 250 million.